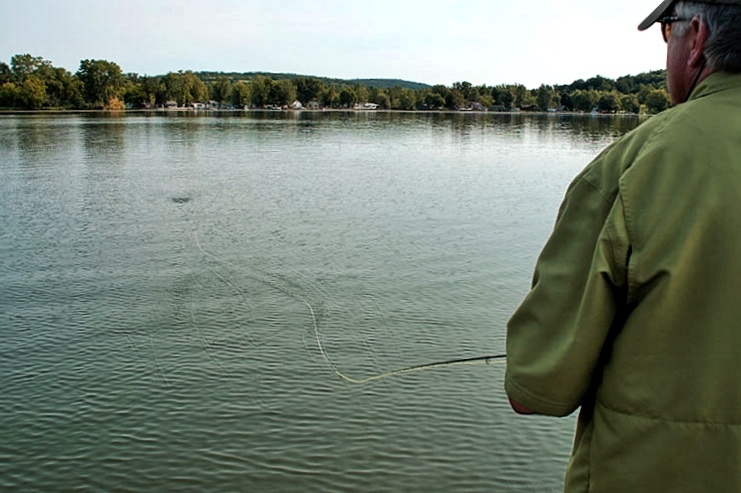 Fly-Fishing for Pike is one thing, but fly-fishing for Musky is another. Both techniques stand equally to one and other, but the difference lies in the materials used. Fishing Musky on the fly is just something special, the rods, the lines, but most importantly, the flies. 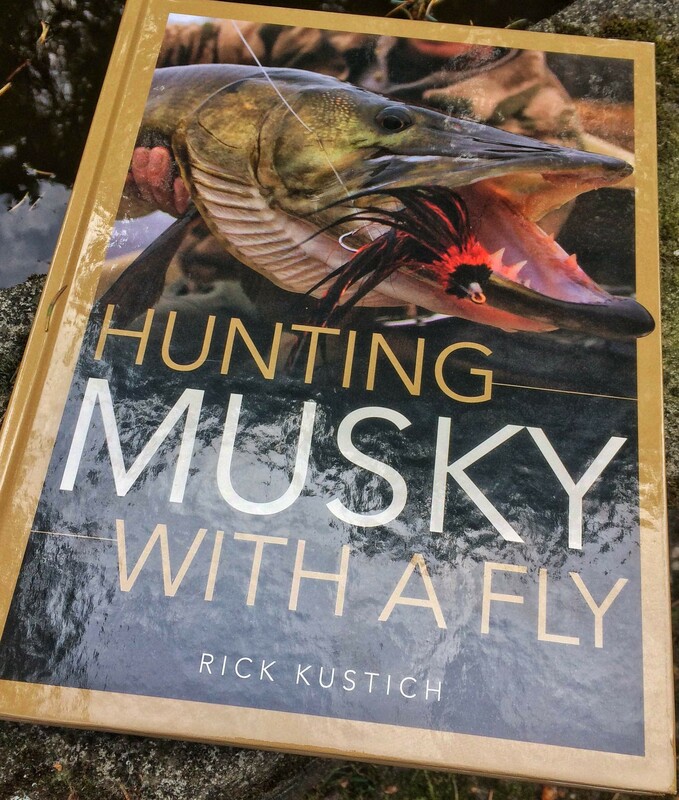 One man that has mastered this art into perfection and has even written his own book about it, is Rick Kustich, and in this Q&A he tells you exactly what makes catching Musky on a fly so special! Q: Rick, first of all, welcome to the site! Great having you as a guest on EsoxOnly.com. I absolutely loved your book ”Hunting Musky with a Fly” and for those who don’t know who you yet, could you tell us a bit more about yourself, what made you become a fly-angler for Musky in the first place? A: I grew up on an island that was surrounded by the upper Niagara River and is host to a population of Musky. I caught the Musky fever as a young boy when I saw a mount of a mount of Musky hanging in a local fishing club. I was amazed that a fish of the size and with big teeth swam in our waters. Everyone in my family fished so I was exposed to the sport at an early age and had become interested in fly-fishing by the time I was twelve. Fly-fishing has become a way of life for me and it was natural that my fascination with Musky would intersect with a love for fly-fishing. Q: When you would compare Musky fly-fishing to any other gamefish on the planet, what is it about that you find it more challenging? Is it the hunt, or just the chase what get’s you going? Did you spend a lot of time researching the behavior of the Musky that lives in the waters you fish in? Or was it just a matter of time before you knew what was going on beneath the surface of the water to catch those toothy fish? A: For me, the most challenging aspect of Musky fly-fishing is the grind of meeting the mental and physical demands required to put one in the net. Dedication will always be rewarded but sometimes there can be a significant gap between hookups. I try to use the satisfaction that is felt by landing a fish as the driving force to work through the low times. A key factor to success is attempting to understand the behavior of the Musky swimming in the water that you fish. This knowledge is developed from numerous sources including what others have written about Musky behavior, personal observation, and talking to top Musky anglers. But the captivating part is that the Musky are unpredictable so there are no set rules and just about anything is possible. Q: Now Musky’s are known to be ferocious predators that chase everything that comes in between their jaws. What made you come to the decision to use such large flies? In Europe it’s highly unlikely people will use streamers that go beyond 12 inches, but it seems that in the USA / Canada this is the daily standard. Do you believe that bigger is better here? Or is it more or less a game of profile, and standing out? A: The idea behind using large fly patterns is to get a Musky’s attention and feed it a meal. This can be an effective approach, especially in enticing larger fish. But bigger isn’t always better. My fly-fishing training tells me that at times it is important to consider the size of the baitfish in the Musky’s diet on your home waters. Also, I believe that a smaller fly may get a fish to commit to a take more readily than a larger fly in situations where a Musky has a high availability food source and is well fed. Q: What do you think makes a fly a good Musky fly? 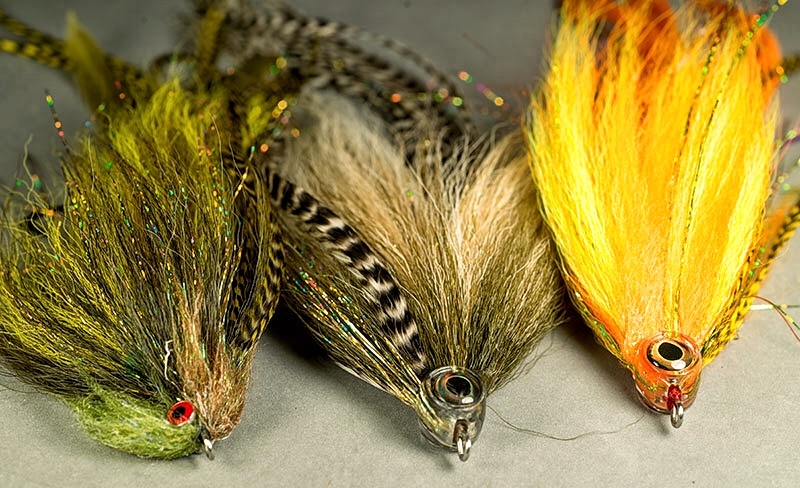 Is there some kind of science that lies beneath the development of flies, such as the more original type of streamers we all used to tie back in the days, like for example deceiver patterns? Or is it a combination of other factors that make a certain fly a fish catching machine? A: An effective Musky fly has a look of vulnerability – bait that is injured or stunned resulting in an easy meal. Most of the patterns that work well for Musky are designed in a way that allows the fly to kick to the side when retrieved. 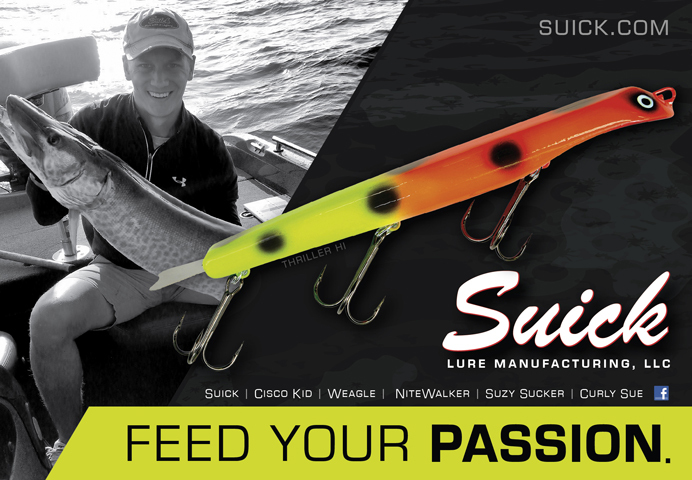 This gives the fish a side view and provides the preferred attack angle for a Musky. Fly tyers such as Blane Chocklett and Matt Grajewski have developed tying techniques that provide this side to side action in the fly. Joe Goodspeed’s goop head patterns push the fly in an erratic movement that looks like a distressed baitfish. Q: When it comes to using Musky flies, what is your favorite size depending on the season and why? Do you find that large flies catch more fish in cold conditions and smaller flies in hot, or vice versa? Plus, what are your favorite colors, do you like to use natural styled flies, or perhaps more shocking colors like a firetiger or something? Also, do you change color depending on the visibility of the water, or do you just pick a favorite color and stick with it all day? Or more importantly, what’s your ideal retrieve speed? A: I tend to fish smaller flies at the beginning of the season. On my home water, I have found that fish recovering from the spawn have preference for smaller flies and I have caught some Big Musky at this time of year on flies that are only four to five inches in length. My fly size grows during the year just as the actual baitfish grow. As Muskies feed heavily to build body weight for the winter I tend to use my largest flies. Fly color varies widely but I do have a tendency to match color to the natural bait in a particular water. Olive, brown, yellow, and white end up in many of my patterns. But I have caught fish on black and bright patterns such as fire tiger or even pink. I usually only make a fly change when completely convinced that the fly currently at the end of my line isn’t attracting fish. But I generally do not make a lot of changes. My basic retrieve is steady and fairly fast. I like to slow it down in cold water. But the key is getting the fly to kick to the side and this may require a little snap at the end of the strip. Q: What kind of hooks do you like to tie your Musky flies on? Did you found that smaller hooks catch more fish than using a larger one for example? What about the hooking percentage of your flies? Do they always grab head first, or do you get more stikes in the back-end of the fly? 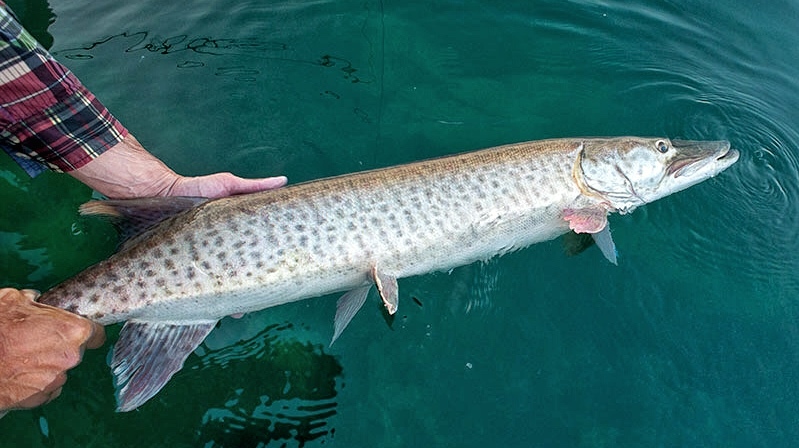 What is the maximum length of a fly you would choose when fly-fishing for Muskies, and why? Can people get away with only 1 single hook in a large fly, or whats your vision on that matter? A: I use single hooks on my fly designs but some anglers use a barbless treble with good success. I use single hooks that are super sharp out of the package, have a straight point, and can be sharpened with a file. I generally use 5/0 as a single hook. For a while, most of my flies had just one hook positioned in the middle or end of the material. But I did feel that there was the possibility of missing a hookup on a take of the fly that was angled more toward the front of the pattern. So now I am using two hooks on my flies and find that I get an equal number of hookups on the front hook as the rear hook. While many Musky patterns reach twelve inches in length and are effective in the fall in northern areas and winter in the southern zones, most of my flies max out at about ten inches. At this length, the flies are a bit easier to cast for eight hours. Q: Now we all know you are the author of what is probably The best Musky fly-fishing book of all time. The way the book has been set up with all the pictures and the description of various topics it’s just a true masterpiece. What made you come to the point where you thought; ”Hey let’s write a book about Musky fishing”, was it something you wanted to do for a long time? How long did it actually take to finish this book? The whole step by step story inside just keeps the reader curious and wanting more until the end. How did you do that? A: I first had the idea for a Musky fly-fishing book a number of years ago well before there was much written about the sport. However, I focused on a couple other writing projects first. It was fortunate that I waited. Even though I caught my first Musky on a fly in 1992, I learned a lot in the last five to seven years that contributed significantly to the final product. The actual writing process took about two years. The step-by-step process is the function of first developing a working outline and then filling in all the details from my notes and experiences. Q: If you had to choose between either catching Musky on the fly in a river, or in a lake, which of the two would have your priority? Do you think fly-fishing for river Muskies is extra special? 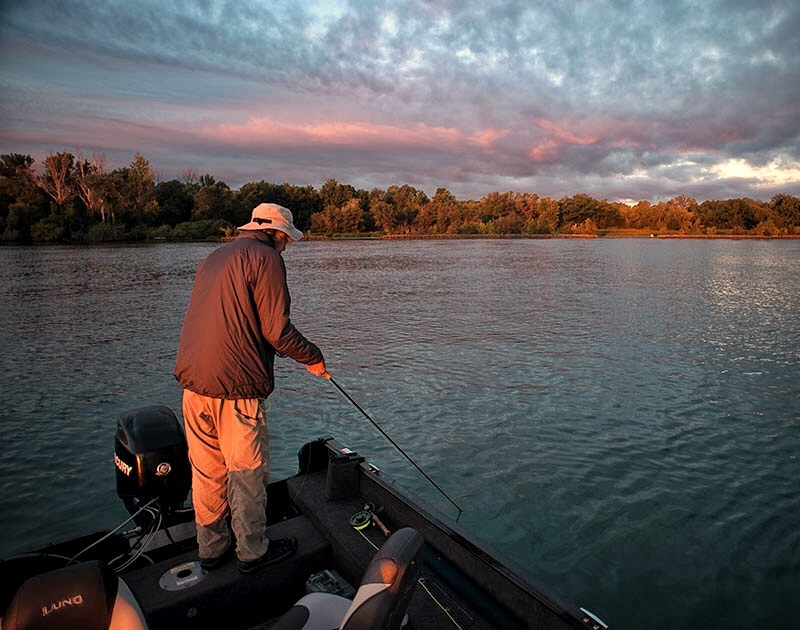 Or do you prefer the lake fishing over flowing water? I noticed that a lot of guys target them with a fly river style, being the fish of 10.000 casts, does this add an extra level of skills, or are both equal to one and other, or are they just as hard to catch in both waters? A: I enjoy fishing for Musky in any type of water. Both rivers and lakes have their charm as well as challenges. The key to either is attempting to isolate the structure or other factors such as bait movement to locate high percentage areas or spot to cast a fly. Methodically covering the open water of a lake reminds me of the measured approach involved in properly covering a pool for steelhead – another passion of mine. But fly anglers can be intimidated by the vastness of a lake, especially water that lakes visible structure. Effectively covering lake water takes a plan and good focus. Michigan guide and Musky fly fishing expert Eric Grajewski uses a wide range of tools including a drift sock and programmable electric motor to cover water at a precise speed. Fishing rivers typically involve casting to specific structural elements where a Musky may await in ambush. Experienced fly anglers that have fished streams and rivers for trout but fairly new to Musky seem to prefer this type of water because of an easier transition. It is usually a more visible game. Q: When it comes to Musky flies, if you had to choose between using natural materials or artificial, what would it be? I, myself am a big fan of using bucktails, because it moves so natural through the water. What’s your personal preference? Do you see any big difference regarding the catch rate when using natural or synthetic products? Plus, what would you rather use in a fly, a lot of flash or just plain natural colors? A: I prefer natural materials. Most of my flies are tied with bucktail and a variety of feathers to create movement in the water. Most patterns use the reverse tying technique to maximize the silhouette of the fly and minimize the materials. I have also used Icelandic sheep as a long flowing material to dress up a Musky fly. The main synthetic material I use is Flashabou, Krystal Flash or some other type of material to provide a subtle element of flash. I some times use synthetics to form the head of a fly. Nick Pionessa, one of my fishing partners, regularly uses synthetic materials and some of these patterns have been quite successful. Q: Now we all know that there are so many fly-rods available these days, it’s hard to keep track on which one truly does the job in carrying heavy loads and getting big flies right there where you want them to be. Do you have any personal preference when it comes to rods? Do you prefer a #12 weight, or can people get away with a #10? What is a rod that you won’t leave the door without? Do you prefer a fast action rod, or something a bit slower? A: I have used everything from a 9 weight to a 12 weight over the years for Musky. But a 10 or 11 weight is my preference. A 9 can be too light for big fish and flies and I sometimes feel that a 12 is a little heavy to cast all day. For casting, I prefer a rod that loads fairly deep to be able to launch the line and large fly. But Musky fishing isn’t just about casting. How the rod handles close in is also important. A stiffer tip creates more responsiveness and action to the fly when performing a figure 8 and more hooking power when a Musky eats the fly close in. A stiffer tip also imparts more action to the fly. Q: When it comes to catching Musky on the fly, and using lines that match the style of your fishing, what kind of lines you like best, and why? Would you rather use floating lines all the time, or just stick to intermediate or sinking? I mean can anyone get away with using an intermediate, for example, all year long? What would you advice someone who is new to Musky fishing? 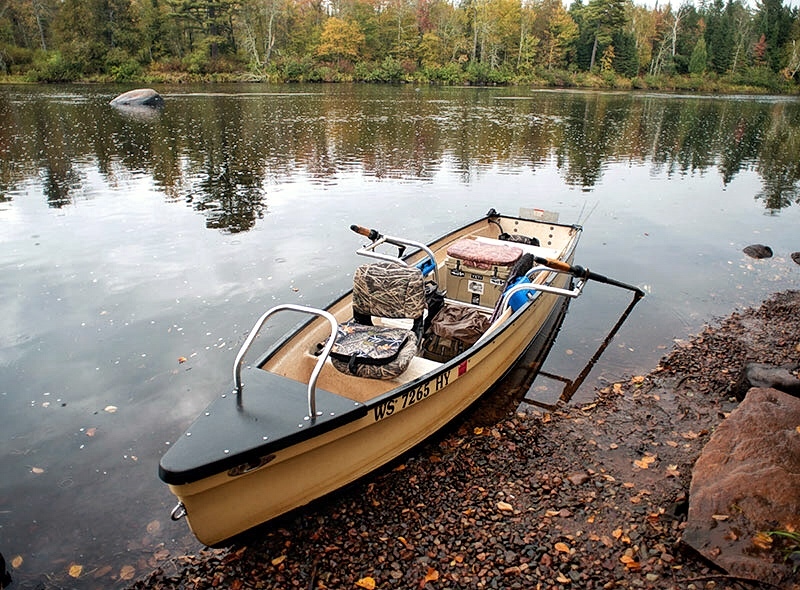 A: On the waters that I fish most my preferred line is a 24 to 30-foot sink-tip. I use tips of 350 to 500 grains depending on the rod and depth of the water. These lines are quite versatile and are capable of covering significant depths but also can be used in shallow water by maintaining a faster retrieve. Floating and intermediate lines also have their place. I use these lines mainly in water with less depth or fishing smaller rivers. The intermediate lines can work in water of more depth with good visibility and can entice a Musky to attack from underneath. Q: If you had to choose from one particular season in a year, spring, summer, fall or winter, what would that be, and why? Why would you choose one season over another, and what kind of role do the flies you use play in there? 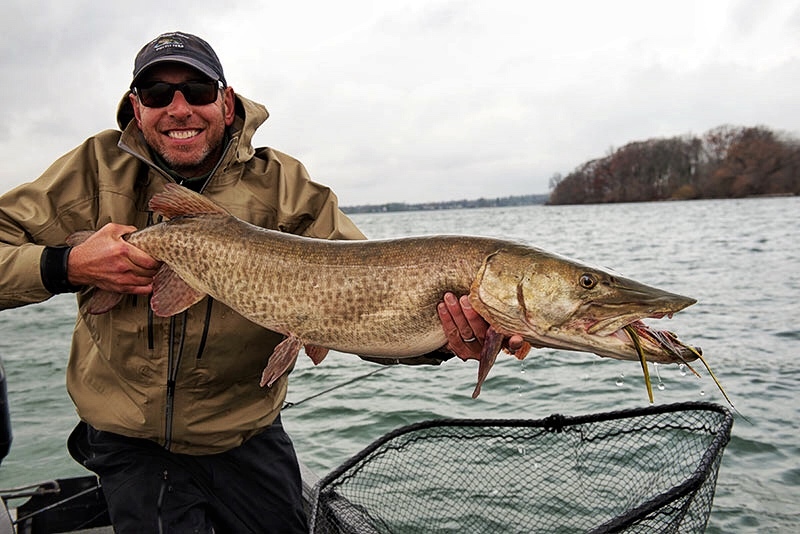 What are your favorite conditions for catching Musky on the fly? A: There is no doubt that my preferred time of year is the fall. As the days grow shorter Musky feed with more of a sense of urgency to build up body weight. At this time of year Musky are heavy and a bit more aggressive. I also prefer fall because there is less angling pressure and overall traffic on the water. 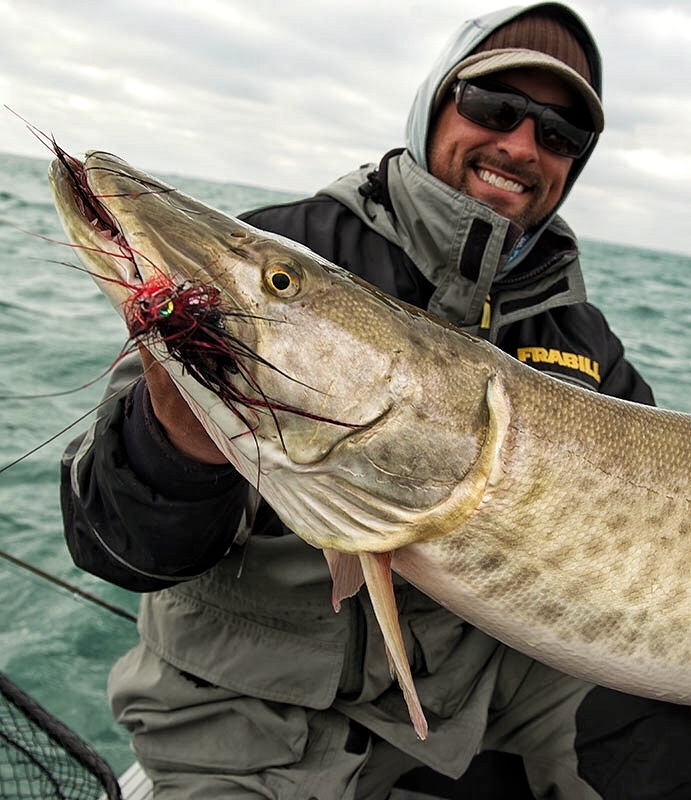 Fall conditions persist into the winter months in the Musky’s southern range. My favorite conditions would include overcast skies and water with somewhat of a stain. Some light rain or snow is good as well. 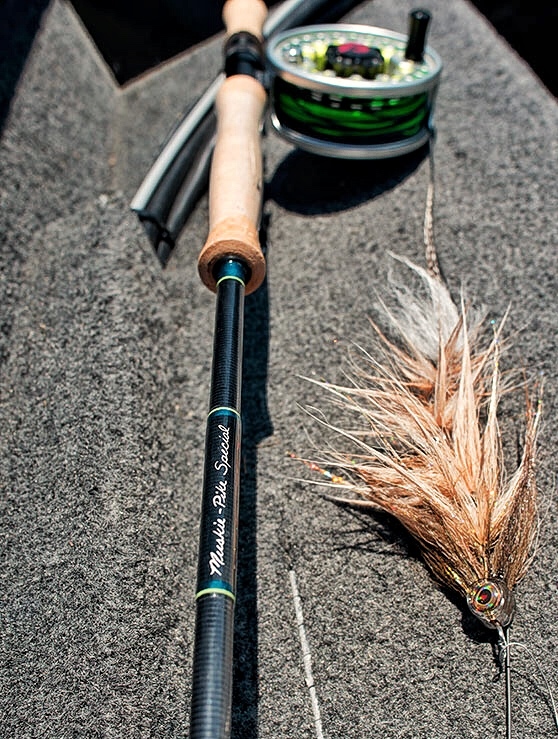 While light to moderate winds are manageable with a fly rod, and in some cases preferred, heavy winds can make casting and line management more difficult. 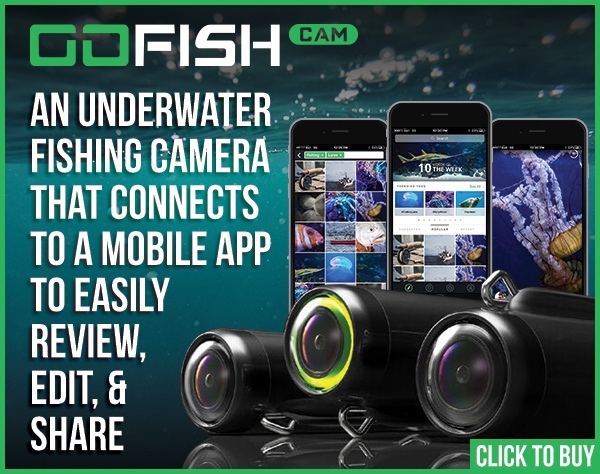 Q: In the ever-evolving world of the fishing industry, considering products that come out every day when it comes to fishing for Musky, and especially fly-flyfishing for them, there is always something new around the corner. 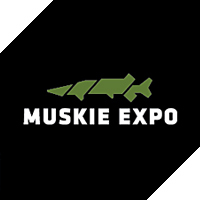 In your book you gave the audience a lot of information about all sorts of products, but what would you like to see added as a new tool for Musky fly fishing? A: That is a tough question considering there is so much high-quality equipment, materials, and clothing currently on the market. There will continue to be refinements in rods in search of the perfect length and action. 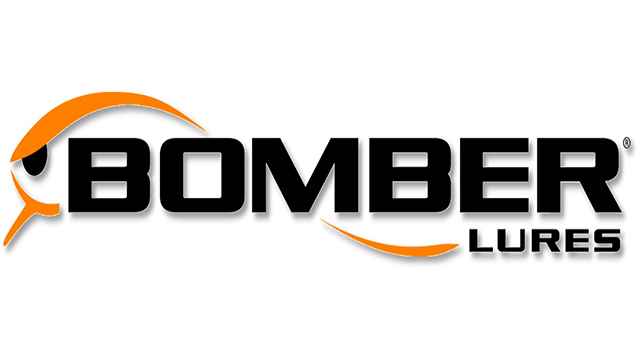 One thing that does come to mind is possibly some advancements in wire bite guard – possibly more varieties in the outer finish to meet various conditions. A wire that was less somehow less visible in clear water conditions could be quite useful. 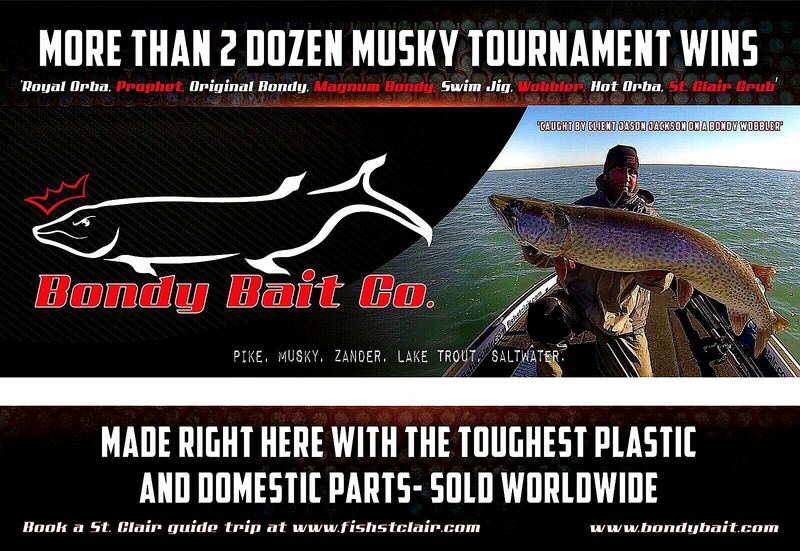 Q: Last but not least, is there anything you would like to say to anyone who is new to fishing for Musky on the fly? Any last minute tips you would give anyone to get them started? A: First be prepared with the proper equipment, flies, and rigging. Be patient, apply yourself, and don’t give up. It can happen on the first cast, the last cast, or any cast in between. Keep the fly in the water and try to learn something every time out. Celebrate your successes and savor your accomplishments.